The Targus 17.3-inch CityGear Travel Laptop Roller is ideal for the travelling professional with a need for storage. This uniquely and spaciously designed case allows you to comfortably store your large-size laptop in addition to clothing and personal accessories. The case features a dedicated iPad pocket that can fit an eReader or 10-inch tablet device, a zip-down workstation with pen loops, business card holders and a zippered mesh pocket for additional accessory items. A special overnight luggage section provides enough room for a change of clothes for short business trips. 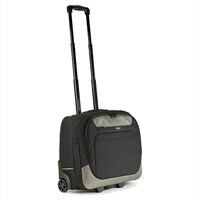 The smooth-rolling wheels and telescoping handle make this rolling case the perfect travel companion.